Lynn Noble (RYT-500, Advanced Teacher of Therapeutic Yoga) was first introduced to yoga at a young age, as a means of improving spinal health. 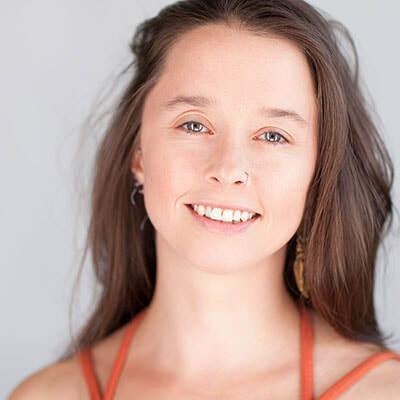 As a Music Therapist, she is fascinated by how the rhythmic synchronization of breath and movement encourages presence, grounding, and awareness. Lynn believes that this mindfulness allows us to find peace, meaning, and intention in every moment and decision. Her passion for this practice is inspired by a vision of empowered self-healing for all, and through a balanced practice that is rooted in breath and alignment, Lynn offers creative invitations to explore the felt sense of our experience through the dynamic tools of yoga. Lynn is infinitely grateful to the teachers that have guided her on this lifelong journey. Prem Prakash acquainted her with living traditions. Gizella Donald, student of Larry Schultz, shared the the eight-limbed Ashtanga lineage. She has also completed the Asta Rocket Yoga and Laughing Lotus Yoga Philosophy trainings. Lynn is currently pursuing her certificate in Integrative Yoga Therapy (IYT) through study with Joseph LePage. Through the practice of yoga (and music) Lynn is able to glimpse her true self. Yoga serves to maintain focus and consistency through transitions, and also develop subtle discernment and confidence. She is overjoyed to share the light she has found and hold space for healing and wellness. While the asana practice supports discipline and a healthy body, the tools of breath, meditation, interoception, deep relaxation, and loving kindness have come to the forefront in her personal practice. Uniting the physiological, intentional, and emotional selves is a guiding force for her teaching. Through mindfulness of self, we can cultivate love for all.